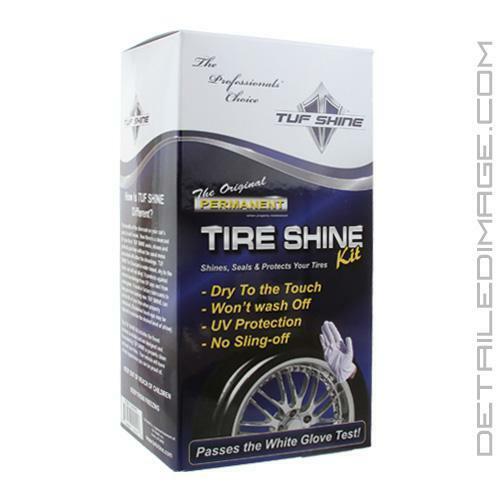 Formerly known as the "Tuf Shine Tire Appearance Kit"
The TUF SHINE Tire Shine Kit is the most revolutionary tire care system we have ever tested. The gloss it provides your tires is unbelievable and the durability far exceeds everything we've tested on the market. This system brings a long lasting shine to your tires like you've never seen before. 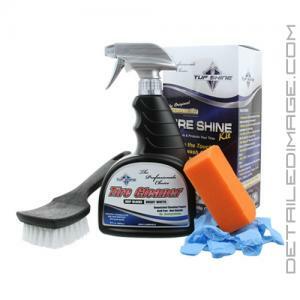 Clean the tires with the TUF SHINE Tire Cleaner and scrub brush provided in this kit. Spray the cleaner on the tires and agitate them with the brush to remove any traces of a silicone based product previously used on the tires. The cleaning step is critical to the success of the next step so do a thorough job, until the bristles and foam are white. This will require several cleanings at a minimum and make sure you rinse your brush clean each time with fresh water. Next use the supplied foam applicator and the TUF SHINE Clearcoat and be prepared to be stunned by the results. It instantly provides that truly long lasting dark shine and glossy appearance that you will absolutely love. 1 - 2 coats provides a dark and slightly glossy appearance. Three or more coats of the dressing will give you an overly glossy appearance and increased protection. The incredible shine is sure to grab your eye as the tires will often look better than new. This 6oz bottle should help you care for at least 20 sets of tires as it should be applied nice and thin for best results. Expect the formula to be dry to the touch in just minutes and it will not feel greasy or oily at all. The long lasting UV protection is another huge benefit to this product. It contains no silicone's, oils, etc. so it's completely safe to use. The coating will last a minimum of several months and can last over a year in ideal conditions. It will even withstand several pressure washings because of how strong it is. Avoid using harsh cleaners on the tires as they will fade the Tire Clearcoat, but gentle cleaners are fine. For maintenance washes within one to two months of the first application we recommend you clean the tires with a mild shampoo. When they are dry you can apply another coat of the Tire Clearcoat for added gloss and protection. Most other tire dressing products are designed to lubricate the rubber, but it washes off or evaporates over time. When this happens, protection is lost and it's then necessary to repeatedly apply dressings to maintain the desired shine and protection. To maintain a "wet" look with other products you have to constantly clean and apply dressings. Heavy-duty cleaners are required to remove the residue build-up used by most silicone-based dressings. Constant cleaning with harsh chemicals can remove factory lubricants that are built into the tire's sidewalls and removing them can cause cracking and dry rot. TUF SHINE has taken a different approach, which is the opposite of competitors. TUF SHINE uses a semi-permanent coating that truly bonds to the rubber and provides long lasting gloss. This amazing water based formula is great for your tires and it doesn't evaporate or fade in high temperatures. Not only does it provide a beautiful finish to the sidewall of all tires, whether it be a matte finish or a high gloss finish, this product also provides 100% protection from UV and ozone concerns. In the 3 years I've used the product it has NEVER cracked or blistered off. Unlike most off the "off the shelf" tire dressings, TUF SHINE Tire Clearcoat is water based and is dry to the touch in just a minute or two after application. It has no oily or gooey residue, will not sling off and will not wash off. What differentiates Tuf Shine from your standard tire dressing is the fact that it's a rubber clearcoat being applied to the tire, and not a "dressing". And after a few minutes drying time, the tire is completely dry to the touch...no black residue will come off onto your hands (or clothes). It's a completely different type product. The finished product is a nice, dark look without being overly glossy, and without any worries of residue slinging onto your freshly detailed car! You should continue to see a nice finish that lasts for months...not days or weeks. Blocks out UV and Ozone to prevent oxidation and cracking. NO OILS or SILICONE that can cause dirt and dust to cling to tires. Anti-static will not attract dust. Dry Finish you can now dust your tires. Completely dry to the touch. No oily or greasy residue. Perfect for Autos, Trucks, Cycles, RV's, Trailers, ATV's and more. Now there's a permanent clearcoat for your tires! TUF SHINE seals, shines and protects your tires permanently without the mess. TUF SHINE is dry to the touch, repels dirt, and will not sling onto paint or wheels. It protects against sun damage, seals in factory lubricants and provides a great shine with minimal effort. TUF SHINE will last the life of your tires when properly maintained (occasional touch-ups may be necessary to maintain desired level of shine). The TUF SHINE kit includes a specially formulated tire cleaner/prep that safely removes old dressings and road grime and prepares tires for the TUF SHINE permanent clearcoat. Spray Tire Cleaner on tires and let stand for 60 seconds. Wet brush and scrub tires thoroughly. Rinse and repeat steps 1 & 2 until suds appear white. Allow tires to dry. Then apply the Tire Shine Clearcoat. Smooth out any runs. I was looking for a long lasting tire dressing for the big 33" knobby tires on my wife's truck so I wouldn't be going through a ton of dressing and reapplying every time we washed the car. Found this product and gave it a try. So far so great! The most difficult part of the process (really just time consuming, not difficult) was the initial tire cleaning process. I'd suggest wearing eye protection while doing this because the soap sprays a lot while scrubbing with the tire cleaning brush. I was able to get all the tires clean with the included spray bottle, but almost used the entire bottle. After letting the tires dry after rinsing, and using a leaf blower to speed up the drying time, I applied the tire shine coating...on a normal tire this would be super easy, but I did find it difficult getting into all the nooks and crannies of the aggressive knobby off road tires. It just took a little more effort and precision using the included sponge. I ended up putting on 2 coats and I'm super happy with the results. A slight shine. 2 weeks later with a couple rain days and a lot of driving the tires still appear to have just been washed and dressed. I'll be washing the truck this weekend so I'm hopeful they look just as good after the wash.
Have used this product on my own vehicle's tires and many of my Client's tires for 7 years and have never had an issue with cracking, white spots, etc. I do wash them very well, including a plain water pressure wash to start the process, and taking the time to really wash them with water before using the TufShine Cleaner and their fabulous brush. Then follow up with another pressure wash and I always get perfect results. My only permanent coating for tires and it has never failed to always look great for 7 years. Some Clients don't want to spend the extra so they get the great Zaino Z16 Perfect Tire Gloss product. Tuf Shine Coating is absolutely the best out there.